As soon as I saw this range it was love at first sight, the beautiful packaging and wonderful descriptions drew me in and I knew I had to try something. Aurelia blend natural ingredients, luxury and cutting edge technology with ease. 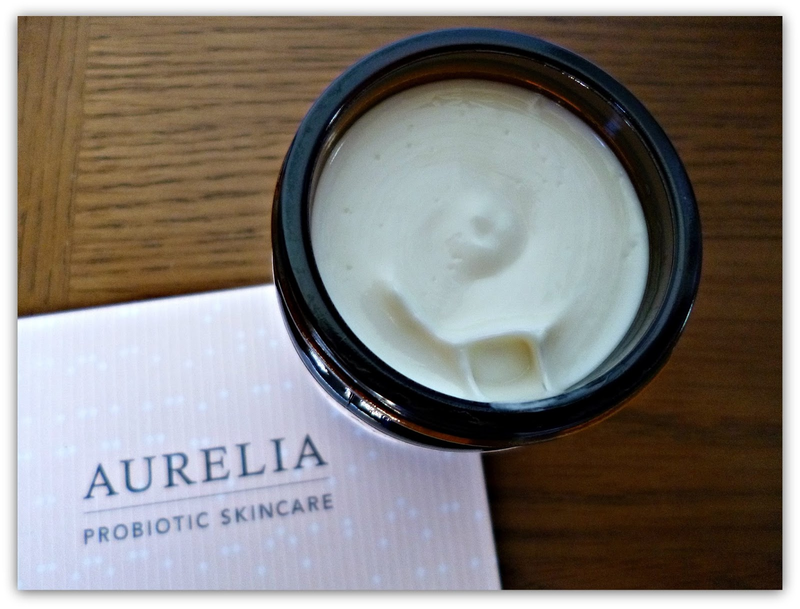 Aurelia are a pioneering British company that aim to fuse science with the best botanical and organic ingredients, the result is innovative skincare that is taking the beauty world by storm. Loved by the Beauty bible and featured in the prestigious magazine Harper’s Bazaar amongst many others, the range is based on Pro-biotic technology which targets inflammation and skin-ageing, providing an advanced skincare solution for those that want cutting edge science and wonderful natural ingredients from their products. 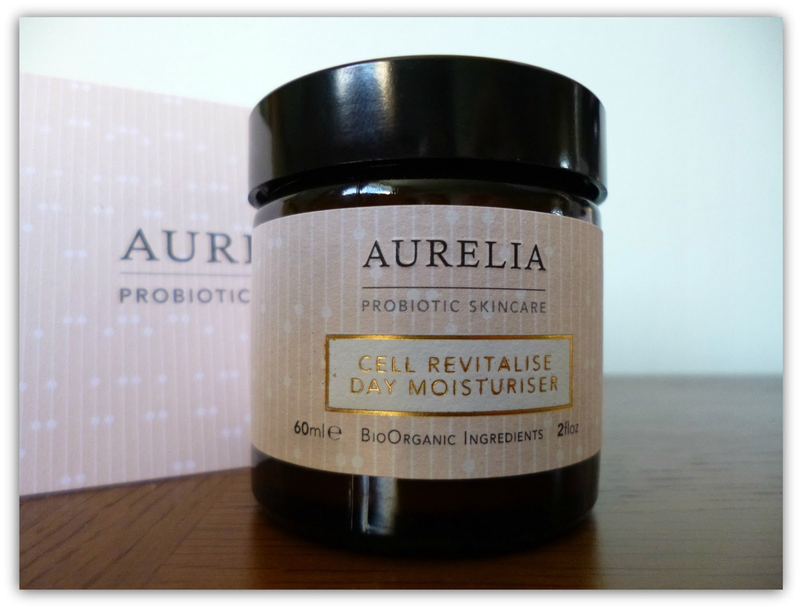 I have been using the Aurelia Cell Revitalise day moisturiser for quite a while now and I love it as much now as I did the first day of use. 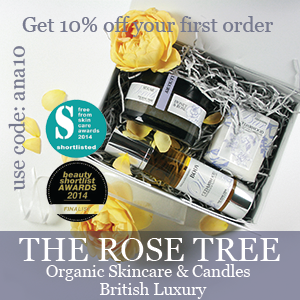 It is a truly luxurious treat and one which has me lusting after the rest of the range. When you touch the cream for the first time you realise how gorgeously soft and smooth it is, when applied to the skin I can almost feel my redness prone cheeks taking a sigh of relief as it soothes and moisturises. This is fairly rich, I would say it is perfectly suited to dry and sensitive skin types, but it is in no way heavy maintaining a light texture from the Aloe Vera. My skin just drinks it up and it leaves a lovely smooth base on which to apply make up. It is very delicately scented with Jasmine, Plumeria, Tuberose and Mandarin, the fragrance is slightly sweet and slightly floral but it is not at all overpowering, it’s perfect in my opinion. 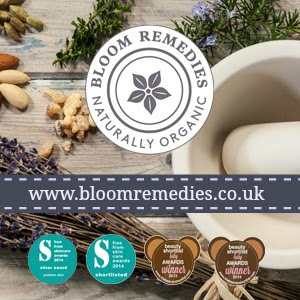 I use a cosmetic spoon to remove the product to avoid contamination of the moisturiser with my fingers, I find I only need a small amount, it is a pleasure to work with and it adds a special touch to my daily routine. This cream has some wonderful ingredients such as the Kigelia Africana which is soothing and firming, Baobab which is rich in omegas 3,6 and 9 and Hibiscus which fights oxidative stress, as well as of course the probiotics. If you are interested in the science behind the probiotics I strongly suggest you have a read on the Aurelia website, the level of detail with which they explain their use of ingredients is superb. They were kind enough to send a lovely bamboo muslin cloth with my order, these are very soft and came beautifully wrapped with a pink bow. I love using a cloth for cleansing and I would say these are perfect for anyone with sensitive skin like me as they are gentle but do a great job of removing cleanser. Bamboo is a sustainable crop that is naturally anti-bacterial too, so good for the environment as well. I think to say that I am enamoured with this beautiful brand would be a slight understatement but I am willing to say that I think this is my favourite all time moisturiser, it just feels so special to use and performs brilliantly on my sensitive skin. Aurelia are committed to responsible and sustainable sourcing of their ingredients, all of the packaging is 100% recyclable and they carry the leaping bunny logo so you can rest assured they are cruelty free. The Cell revitalise day cream retails at £58 for 60 mls, it is definitely a more luxurious product and absolutely worth the price tag. 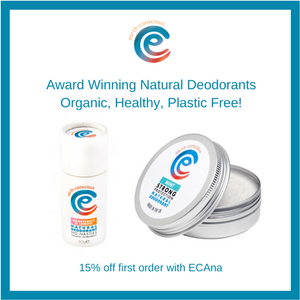 I would love to know if you have tried this wonderful brand, what should I try next?